California College San Diego is teaming up with Junior Achievement to provide students with an opportunity to gain volunteer experience. All students who volunteer at least 20 hours receive a certificate/letter of appreciation that can be added to their resume and portfolio. It’s an excellent opportunity to give back to the community, develop new or existing skills, and to network with others. 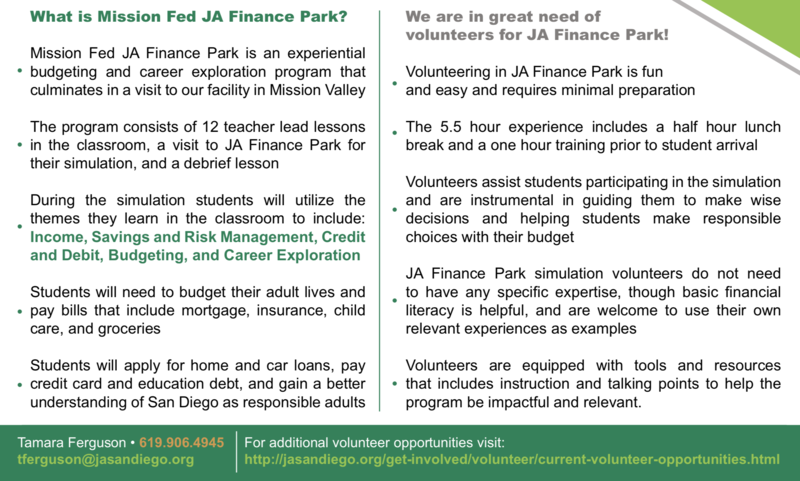 This volunteer opportunity is with Junior Achievement (JA). JA is the nation’s largest organization dedicated to giving young people the knowledge and skills they need to own their economic success, plan for their futures, and make smart academic and economic choices. Junior Achievement’s programs—in the core content areas of work readiness, entrepreneurship, and financial literacy—ignite the spark in young people to experience and realize the opportunities and realities of work and life in the 21st century. Biztown– Volunteer in one of the 21 businesses in JA BizTown with 4-8 students, assisting the students with their business/job tasks throughout the day while sharing personal stories of work experience. Finance Park– Volunteers guide groups of 8-12 students through the adult life simulation, where students learn to budget, save, and spend for themselves and their virtual families. JA Days– Volunteers delivers a full grade program to students during a classroom visit. Typically from the time instruction begins to the grades’ lunch time. Why I am not getting a refund of my Pell Grant?